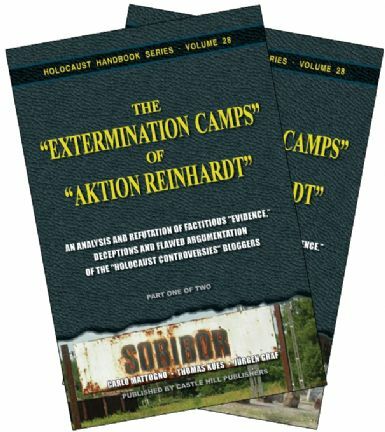 Mattogno Carlo Kues Thomas and Graf J rgen The Extermination Camps of Aktion Reinhardt - Part 1. Mattogno, Carlo; Kues,Thomas and Graf, Jürgen: The “Extermination Camps” of “Aktion Reinhardt” - Part 1. Holocaust High Priest weaves together five compelling and interrelated narratives. The book’s main concern is to present the world’s first unauthorized biography of Elie Wiesel. It shines the light of truth on the mythomaniac who, in the 1970s, transformed the word “Holocaust” and made it the brand name of the world’s greatest hoax: the unfounded claim by an extremist segment of World Jewry to the effect that the German government’s wartime policy of territorial transfer of Europe’s Jews out of the Reich was in actuality an “extermination program.” In these pages, both Wiesel’s personal deceits and the whole myth of “the six million” are mercilessly exposed and laid bare for the reader’s perusal. Unfortunately, Zionist control of the U.S. Government as well as the nation’s media and academic apparatus has allowed Wiesel and his fellow extremists to force a string of U.S. presidents to genuflect before this imposter as symbolic acts of subordination to World Jewry, while simultaneously forcing U.S. school children to submit to Holocaust brainwashing by their teachers. The second strand involves close readings of several of Wiesel’s published texts, with emphasis on his alleged “autobiography,” the novel Night. The author demonstrates Wiesel’s appalling ignorance of both the physical details and layouts of the Auschwitz and Buchenwald camps, and this ignorance also extends to German administrative protocols and procedures. Amazingly, the novel’s chronology of the events said to have “really happened” in the author’s life is also disjointed, confusing and internally contradictory. The author also shows the role played by the meme of “retroactive continuity” in the telling of the Holocaust story. The third strand involves an historical account of the rise of Holocaust revisionism mainly in the U.S. and France in response to the many obvious lies contained in the Jewish Holocaust narrative. From the sudden appearance of the revisionist work of Profs. Butz and Faurisson in the 1970s, through the Zündel trials of the 1980s, to the work of contemporary revisionists like Bradley R. Smith, Germar Rudolf, Carlo Mattogno, Thomas Kues and others today, this study shows, through the words of the Holocaustian extremists themselves, how effective the revisionists have been in demolishing their lies. The fourth strand shows how certain ambitious and unscrupulous U.S. Catholic intellectuals have hitched a ride on the Holocaust bandwagon as a means of advancing their careers. Ritual denunciation of the alleged “silence” of Pope Pius XII is unfortunately very much a part of this behavior. Finally, the fifth strand concerns all those U.S. Jews, young and old, who have been turned off by one or another aspect of the Holocaust story and its use within the U.S. Jewish community, but who never criticize it openly for non-Jewish ears. As for younger U.S. Jews, Rabbi Jacob Neusner has been pointing out for years that it has not kept them Jewish. What he calls the “Holocaust and Redemption” cult within U.S. Jewry has contributed to a pronounced abandonment of Jewish identity through intermarriage with non-Jews at percentages never before seen or even imagined.